The Art of Star Wars: The Last Jedi is much more than a bunch of pretty pictures. Buried in Phil Szostak’s 256-page book are some fascinating insights into the production of the film. And while we highly recommend you flip through yourself, we picked out our favorites. 1) One of the earliest pieces of art for The Last Jedi was actually supposed to be in The Force Awakens. Designer Doug Chiang painted an image of Luke’s X-wing underwater in February 2013, but it got cut from that movie, and was used in TLJ instead. 2) A storyboarded version of the opening shot would have panned down from the crawl to reveal what at first looks like a huge planet, but was actually going to be the top of the tank Finn is recovering in. 3) The opening battle scene of the film wasn’t always directly after The Force Awakens above D’Qar. But choosing the location informed the design of the First Order’s Dreadnaught. The top was always flat, to allow for Poe’s heroics, but guns were added on its bottom, in order to fire at the planet below. 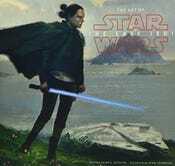 6) There was a piece of concept art that would have had Rey abandon the Millennium Falcon in the waters of Ahch-To because she couldn’t find a place to land. 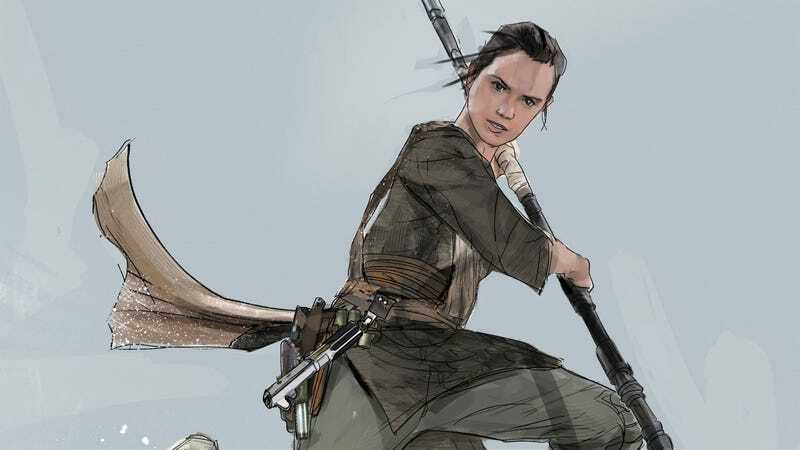 7) For Rey’s costume change after Han’s death, an early design had her directly influenced by the smuggler, with a short blue jacket and brown pants with red marks down the side. 9) The codebreaker storyline on Canto Bight was also much more complex in early drafts and designs. Originally, Finn and Rose were going to find him playing keyboards accompany a lounge singer. He was there “casing an insectoid warlord known as the Butcher of Brix” from whom he planned to steal “the blood jewels that finance his murderous regime.” The three would go on a journey to find a backpack with thieving tools, only to get caught on the roof and Finn and Rose put into prison. 10) Late in the design process, Lucasfilm president Kathleen Kennedy said that the design of Canto Bight didn’t feel “Star Wars” enough to her. So the team scrapped everything and ultimately drew inspiration from early Ralph McQuarrie drawing’s of Jabba’s Palace. 11) The whole Canto Bight scene originally started with Rose and Finn breaking into a clothing shop to put on fancy clothes to blend in. However, Finn would’ve put his tuxedo on backwards, and everyone was going to laugh at him. 12) There was a bathhouse sequence on Canto Bight that was designed and shot but not used in the movie. It’s not entirely clear how it would have played into the film, or why it was cut, but it seems like it may have been another elaborate, lavish location for the fathiers to smash through. It was a steamy place complete with aliens in all manner of dress, lounging around and sweating. 13) Before DJ was in the movie, Finn, Rose, and BB-8's arrival on Snoke’s ship started with several different gags. One was them following a trail of lint into a laundry room. Another was an homage to Han and Chewie running into a mass of Stormtroopers on the Death Star, except this time, all the suits would be empty. 14) At one point, there was a line in the movie where Snoke mentioned his gold slippers. 15) The three flashbacks in the film, which are an homage to Rashomon by Akira Kurosawa, were one of the final things to go into the script before shooting. Johnson saw them as a way to give Rey more emotional impact when leaving Ahch-To, by having Luke initially lie about what happened between him and Ben Solo. Honestly, we can’t recommend this book enough.